Keep your flowerbed and lawn separate and beautiful using these Panacea Black Straight Edge Landscape Edging pieces. This set of 12, classic steel sheets handily forms a boundary between your flowers and your grass, and the straight top and base offer plenty of versatility. The flat bottom edge of each 36" long panel keeps it level during installation, while the black finish furthers the traditional motif. The panels can also bend slightly to create curves in your flowerbed, and a pocket in the center accommodates a stake for support. Additional pockets on each edge also perfectly hold a Panacea Black Metal Landscape Edging Stake (not included), for a lasting and strong installation without the need for overlapping. The steel body remains durable and protects the edging from the elements, while the black finish offers a timeless hint. 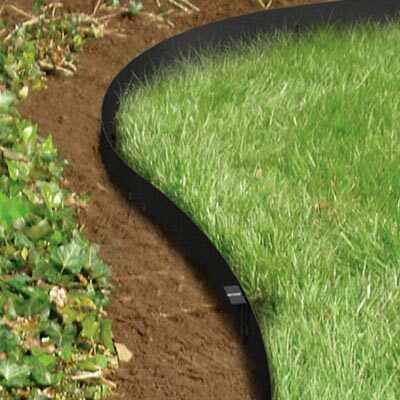 Define different areas of your landscaping in moments with this Black Straight Edge Landscape Edging. Note: This case pack includes 12 of the Panacea Straight Edge Landscape Edging sections. The stakes shown are not included.